Bearing floor-to-ceiling windows to brighten its interior, officials quipped the city no longer is home to an “Amshack” station. 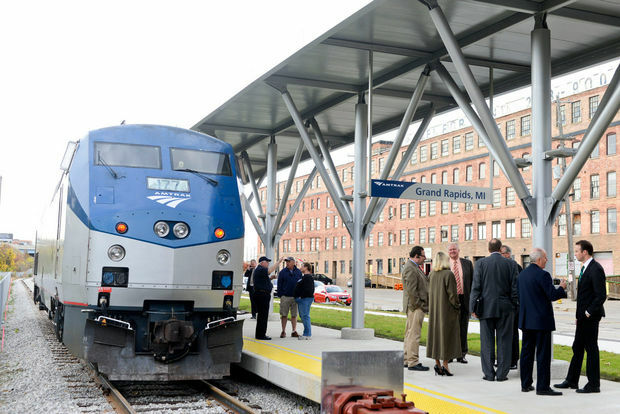 The new Vernon J. Ehlers Amtrak Station ceremoniously replaced its Wealthy Street predecessor early Monday, October, 27, 2014, connecting Grand Rapids to Chicago. Ehlers, the former West Michigan congressman whose name appears on the hub’s façade, could not attend though his statesman-like approach to Congress was highly regarded among those at the station’s grand opening. Retiring U.S. Sen. Carl Levin, D-Mich., remarked Ehlers had a grasp on the community and fought for its people while serving in the House from 1993-2011. It was Ehlers who worked in Washington, D.C., to secure federal funding for the $6.1 million station. Ehlers later would vote against the spending bill that contained appropriation dollars for the station in spring 2009. He said it was irresponsible during a time of crisis — the height of the recession. Ehlers’ daughter, Marla, spoke on behalf of the family. She said Vern Ehlers used to joke that he served on education and science committees because of his profession. “… And he served on the (House) Transportation committee because he wished to be reelected,” Marla Ehlers said. Other guests at the ceremony include U.S. Rep. Fred Upton, R-St. Joseph, Grand Rapids Mayor George Heartwell, plus Michigan Department of Transportation and Amtrak leaders. The Jewel Tones, the City High chorale, entertained guests. Officials wager passengers not only will enjoy the convenience of the new location near the Rapid bus station, but that the amenities will bring a boost to ridership on the Pere Marquette line. MDOT reports the route carried 109,501 passengers between Grand Rapids and Chicago in 2012 and 102,932 riders in 2013. About 75,964 passengers have traveled the route so far in 2014, with the previous winter to blame for the dip in ridership, said Amtrak spokesman Marc Magliari. The new Amtrak station, at 440 Century Ave. SW, only is steps away from The Rapid’s Central Station. That transportation hub serves greater Grand Rapids with at least 20 bus routes and its new bus rapid transit system, Silver Line. It features at least 115 parking spaces, a covered platform, a larger waiting room and a clock tower paying homage to stations of old, seen from U.S. 131 to the east. The station’s opening was pushed back several times following its groundbreaking in 2011. The station’s inaugural riders left on the first train at 7:40 a.m. Monday, which is expected to return at 9:55 p.m. If successful, a second daily trip could run on the line, something Heartwell predicts is on schedule. “This is the first of many good things to come,” he said.